“Who gives himself with his alms feeds three—himself, his hungering neighbor, and me.” –James Russell Lowell (1819-1891). I was walking down Sandy Boulevard to catch the train yesterday when I was stopped by a young fellow going the other direction. He was around thirty with unruly, shoulder-length brown hair, beard and moustache. He was dressed in Portland-esque, Bohemian-style clothing. He began making gestures at me. His mouth moved, but no discernible sounds came out. I immediately realized that he was a deafmute. The man finally got across that he needed money to catch a bus. I pulled a five out of my wallet. He made a gesture, and I read the words on his lips: Thank you. Then he was on his way. I was a block down the street before it occurred to me that perhaps this guy wasn’t a deafmute at all, just a very accomplished panhandler. For one thing, when deafmutes sign, they usually “speak” simultaneously, making distinctive sounds peculiar to the speech of the deaf or severely hearing-impaired. This guy had made no such sounds, yet his lips had moved as though he were attempting to speak. Moreover, upon reflection, it seemed that his gestures weren’t the smooth, precise movements of actual signing, but rather an attempt to look like he was signing. How many randomly selected people on the street would know the difference? 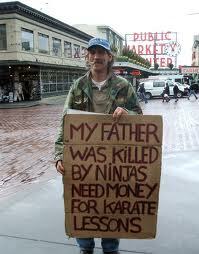 Maybe I’m just cynical, and I don’t really regret giving him money, especially if he really needed it for the bus. But it’s hard not to be suspicious in such situations these days. The panhandling industry has evolved to overcome the weary cynicism of the general public, who’ve been hard hit by their own financial problems in recent years and are quite aware that there are large numbers of people in our society who beg for alms as a deliberate alternative to work. There are some very clever people out there who laboriously avoid work. I’ve seen some spectacular examples. Once, a guy got down on one knee and disclosed his great suffering to me in an impressive speech. Another guy was with a friend and told me his car had broken down, leaving him stranded in Anchorage. He had to get home to Fairbanks but hadn’t the money to pay for the repairs. He made the mistake of mentioning a specific auto shop, and he named the motel and room number where he was supposedly staying. Normally, mentioning specifics would be a powerful way to convey credibility, but I told him I planned to make some calls before I gave him any money. He asked how I was going to get the money to him, and I quoted back to him the motel and room number. He stammered that they weren’t actually staying there anymore, and then, realizing his whole presentation was imploding, told me to forget it and walked away with a humiliated expression on his face. I marveled afterwards at his calm confidence, his natural posture. It had been a masterful, cutting-edge pitch. I’ve been particularly impressed by advances in the art of sign making. The art makes use of humor, honesty and persuasion as well as pathos. One man ensconced himself in the snow on a median at the entrance to a large South Anchorage mall. He had a sign that said, “I Will Not Give Up.” Funny, but sitting in the snow waiting for handouts looks a lot like giving up to me. Another guy I saw in Portland, Oregon, was young and able bodied. He had a sign that said, “One Coin Will Help.” I wonder how angry he would have been if I had given him a nickel or a dime and left it at that. Hey, he said it would help. My mother told me a story years ago that I never tire of hearing. She was coming out of a bank in downtown Anchorage one winter afternoon and was approached by a thirty-something blond man wearing thrift-store clothes. He was using crutches, and one of his legs was wrapped in an ace bandage. He asked her for money, and told her that in addition to his ambulatory challenges, he was sick, with pneumonia in one lung. My mother declined the transaction, pleading insufficient funds. But the clincher comes into play a few hours later, when she went into the Woolworth’s down the street. She was standing in line to make her purchases and spotted the same blond man at the counter. She stood ten feet away and watched him buy a pack of cigarettes, no doubt to treat his pneumonia. Jim Basinger, an Episcopal minister, told me a story about two men who had come to his church, penniless and asking for help. 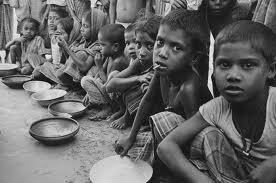 He gave them food and clothing, since he had learned the hard way not to give out money. The men were later seen out on the street attempting to sell the clothes for money. For a period of 20 years or more, West Anchorage was livened up considerably by the regular streetside presence of Floyd Kaleak, an Alaska Native who was mentally retarded and lived at a local home for developmentally challenged people. All his needs were taken care of there, but Floyd spent his days jumping up and down at various street corners, waving wildly at passing motorists. 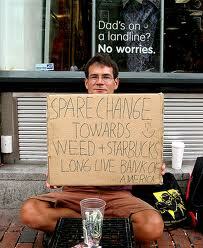 He had a large cardboard sign that read: Contributions Gladly Accepted. He got them, too. While I was attending classes at UAA, I met a young man who worked at the home where Floyd lived. He gave a speech about the facility and mentioned Floyd and his entertaining method of panhandling. When asked about Floyd’s panhandling receipts during the Q & A, he responded with a laugh, “Floyd’s doing really well.” So well, in fact, that toward the end of his life, the Anchorage Police Department told Floyd he had to obtain a business license to panhandle! I am grateful that in spite of all the ways charity is exploited in this society, God keeps my heart alive for the suffering creatures in my environment. I wouldn’t have it any other way. Otherwise I might have kept driving one day in Anchorage not so many years ago, when I noticed a man in his 50s on the street corner, where a Wal-Mart parking lot feed intersected with Benson Boulevard. It was fall, and he was dressed in grubby jeans and a camouflage jacket over several other layers of clothes. His cardboard sign identified him as a homeless veteran. I don’t know if it was the prompting of the Spirit or intuition, but I knew immediately that this was no casual career choice. The man’s face exuded humility and weariness. There was nothing of bitterness, anger or entitlement in his features. I felt his pain. When I gave him the eight or nine dollars I had in my pocket, his eyes shone with relief and gratitude, like a hungry waif receiving a bowl of hot soup. I only wish I’d had more to give that day. This entry was posted in Giving and tagged alms, charity, compassion, giving, hungry, impoverished, love, mercy, needy, poor, suffering. Bookmark the permalink. Doug, this is your mother speaking. I’m here to modify just a bit my story, which you reported pretty accurately, but here’s the rest of it. It was a cast on his leg rather than a wrapping, It’s true that he accosted me coming out of the bank, but I was unable to help him even if I’d wanted to because the funds I had belonged to my employer and were all in large denominations; I had no money of my own with me. It wasn’t hours later that I saw him again in Woolworth’s; it was a few minutes later, and after he had bought his cigarettes, he spotted me and started ranting at me for being so ungenerous. He hung around Anchorage for several months and was seen by many of my friends at various times. The cast tended to shift from one leg to the other according to his mood or whatever. He often had a dog with him, and most of us felt sorrier for the dog than for him. I would have done the same. I mean even if he did try to play me he must have really needed the $5 in-order to go thru such great lengths.